Tuberculosis can be cured and could be eradicated. For this to happen, however, patients have to receive the right treatment. Researchers at the Makerere University and the University of Zurich were able to demonstrate that the levels of medication used are often too low. As a result, patients remained contagious with the dangerous disease for longer than necessary. More than 4,000 people worldwide die from tuberculosis every day. This means the disease tops the list of the most common causes of death that result from a single pathogen. The people who are most affected are those also suffering from an immune deficiency, such as an HIV infection. However, the high rate of mortality isn't unavoidable: Tuberculosis can be cured if the relevant drugs are used correctly. But this is precisely where the problem lies. The most important medications for treating tuberculosis – in Switzerland, too – date back to the 1960s: Treatment is lengthy, involves several pills, and comes with numerous side effects. People thus often discontinue their treatment, which means that patients continue to suffer from the disease and also pass it on to others. In addition, the optimal dose of tuberculosis drugs has also not yet been determined. Led by Prof. Jan Fehr, researchers at UZH and the UniversityHospital Zurich have now joined forces with a team of researchers from a partner university in Kampala, Uganda, to tackle this question. Over a two and half year period, the researchers repeatedly measured the concentration of tuberculosis medication in the blood of 268 study patients suffering from pulmonary tuberculosis as well as an HIV infection. At the same time, they carried out further tests including tests to detect the pathogen in the sputum. Patients took their medication in accordance with the currently valid dosage guidelines of the World Health Organization (WHO). "We were able to show that the concentrations of the two principal tuberculosis drugs, namely isoniazid and rifampicin, in the blood were very clearly below the internationally targeted levels," explains Prof. Jan Fehr. These lower blood concentrations mean that tuberculosis patients cough up tuberculosis bacteria for a longer period of time compared to patients with higher levels of medication in their blood. "These patients with lower levels of isoniazid and rifampicin thus also remain contagious for longer." This in turn has far-reaching global consequences. The WHO aims to cut the rate of tuberculosis deaths by 90 percent by 2030. However, this will only succeed if the global epidemic can be controlled and infections don't spread any further. To achieve this, we must think about how routine checks of the levels of the major tuberculosis drugs can be implemented and how to increase the dosage if the levels are too low. Relevant studies need to be carried out, and should be based on the SOUTH study, which was the first study worldwide to investigate this topic in great depth. Since 2012, there has been a close partnership between the University of Zurich, the UniversityHospital Zurich, Makerere University, and the Infectious Disease Institute in Kampala, Uganda. As a result of the growing global challenges posed by infectious diseases, the two partner organizations decided to enter into a long-term cooperation in the fields of research, clinical practice, and teaching. Current efforts are focusing on the global optimization of healthcare for patients suffering from HIV and/or tuberculosis. A physician from the UniversityHospital Zurich's Department of Infectious Diseases has been on site in Kampala permanently since 2012. The cooperation also extends to the education of medical students, physicians, patient care staff, and junior researchers from Uganda and Switzerland. So far, more than 10 Swiss medical students have completed practical training, a Master's or a doctoral thesis at the Makerere University with the supervision of UZH. 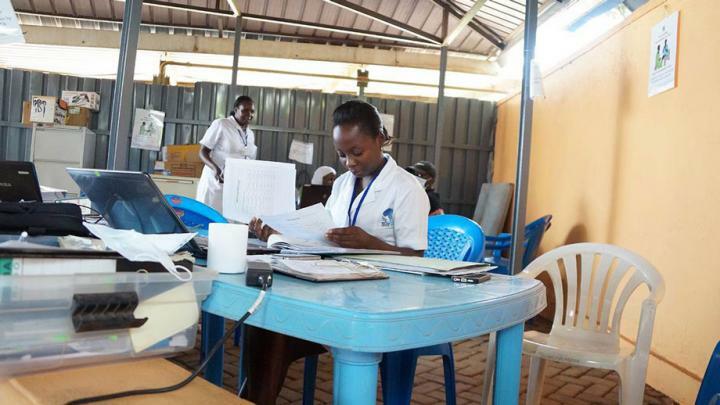 Ugandan medical students are instructed at the patients' bedsides during ward rounds at the Infectious Diseases Institute at the Mulago National Teaching and Referral Hospital. A Ugandan physician was able to obtain her PhD in connection with the study mentioned above. In addition, a young Ugandan lab technician was trained in measuring TB and HIV levels in the blood of patients. The trained lab technician is currently passing this knowledge on to his colleagues while also studying for a Master's degree in pharmacology. Measuring the blood levels of tuberculosis medication as well as of the newer HIV drugs has only recently become possible in Uganda and can now be performed for the long-term benefit of patients in the entire region. More information is available at http://www.r4gh.org.